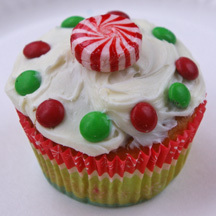 All you need for these simple Christmas cupcakes is some mini M&Ms and a Starlight mint! What You Need: 1 cupcake; white frosting; red and green mini M&Ms; Starlight mint (the peppermint ones that taste like candy canes, or the green ones). How to Make It: Frost cupcake. Unwrap mint and place in center of cupcake. Add M&Ms around the edge, upside down, alternating red and green. This entry was posted on Saturday, December 19th, 2009 at 11:24 am	and is filed under Christmas cupcakes. You can follow any responses to this entry through the RSS 2.0 feed. Responses are currently closed, but you can trackback from your own site.